Map of the Pennsylvania Railroad Philadelphia Division. 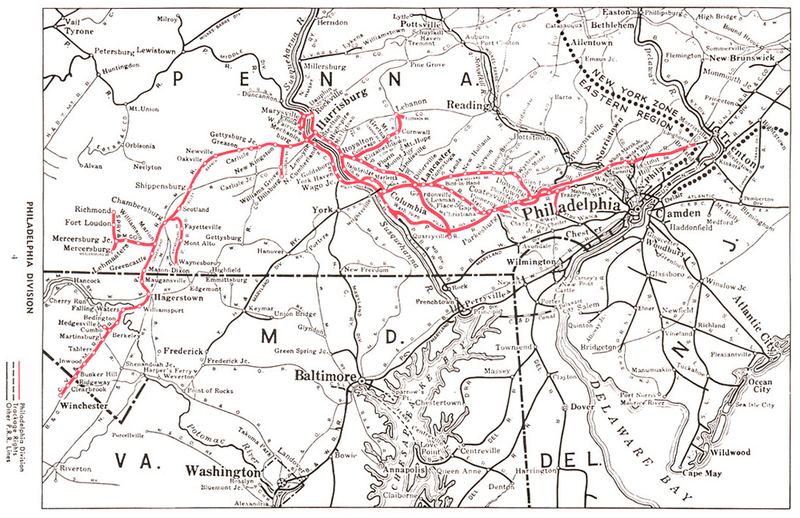 This map illustrates the entire division including mainline, branches and secondary tracks in the region between Philadelphia, Harrisburg, and the Cumberland Valley via Hagerstown Maryland. Over the next few months, we will be following the mainline of the former Pennsylvania Railroad on a tour moving east from Harrisburg to Philadelphia, exploring the landscape, physical plant and facilities along the line. In addition to the mainline, we will follow the Atglen and Susquehanna Low Grade, Enola Branch, Royalton Branch and some of the Columbia and Port Deposit line too. This work represents the past year of collaboration with Amtrak and was a sizable piece of railroad to cover in such a short time. For this segment there are currently over 250 photographs, and there will be more to come while I work to fill in a few gaps. Beginning this Friday our first series of posts will cover the Harrisburg Terminal area. This historic and pivotal location on the PRR was significant as the origin of the initial construction to Pittsburgh in 1852 later continuing to grow and thrive with the company's development. Serving Amtrak and Norfolk Southern today, the Capitol City of the Commonwealth has been host to countless freight and passenger trains over the past 160 years.